Kazimir Severinovich Malevich (February 23, 1878 – May 15, 1935) was a painter and art theorist, pioneer of geometric abstract art and one of the most important members of the Russian avant-garde. It remains one of a great mysteries of 20th century art, how, while leading a comfortable career, during which he just followed all the latest trends in art, in 1915 Malevich suddenly came up with the idea of Suprematism. The fact that Malevich throughout all his life was signing and re-signing his works using earlier dates makes this u-turn in his artistic career even more ambiguous. However in 1915 he published his manifesto From Cubism to Suprematism. In 1915-1916 he worked with other Suprematist artists in a peasant/artisan co-operative in Skoptsi and Verbovka village. In 1916-1917 he participated in exhibitions of the Jack of Diamonds group in Moscow together with Nathan Altman, David Burliuk and A. Ekster, among others. 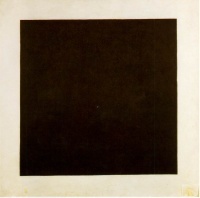 Famous examples of his Suprematist works include Black Square (1915) and White on White (1918). After the October Revolution (1917), Malevich became a member of the Collegium on the Arts of Narkompros, the Commission for the Protection of Monuments and the Museums Commission (all from 1918–1919). He taught at the Vitebsk Practical Art School in the USSR (now part of Belarus) (1919–1922), the Leningrad Academy of Arts (1922–1927), the Kiev State Art Institute (1927–1929), and the House of the Arts in Leningrad (1930). He wrote the book The World as Non-Objectivity, which was published in Munich in 1926 and translated into English in 1959. In it, he outlines his Suprematist theories. In 1923, Malevich was appointed director of Petrograd State Institute of Artistic Culture, which was forced to close in 1926 after a Communist party newspaper called it "a government-supported monastery" rife with "counterrevolutionary sermonizing and artistic debauchery." The Soviet state was by then heavily promoting a politically sustainable style of art called Socialist Realism—a style Malevich had spent his entire career repudiating. Nevertheless, he swam with the current, and was quietly tolerated by the Communists. Unless indicated otherwise, the text in this article is either based on Wikipedia article "Kazimir Malevich" or another language Wikipedia page thereof used under the terms of the GNU Free Documentation License; or on original research by Jahsonic and friends. See Art and Popular Culture's copyright notice. This page was last modified 08:58, 9 April 2014.